In this free resource, the SweetRush Talent Solutions team offers insights, tips, and best practices to help learning and development professionals interview and choose the right temporary talent. San Francisco, California – November 5, 2016 - SweetRush is pleased to present its new eBook: How to Interview Temporary Talent for Learning and Development Positions: Finding the Best Fit for Your Needs, written by staffing and recruiting experts Arturo Schwartzberg, SweetRush Chairman and Cofounder, and Rodrigo Salazar, Manager of Talent Solutions at SweetRush. Why interviewing temporary talent is different than full-time hires. How to manage and what to expect from the interviewing process. How to ensure your candidate has the ideal skills for the learning and development position. How to assess if your candidate is the perfect cultural fit. An infographic on how to recruit learning and development professionals (with or without a staffing vendor). A tried-and-true list of questions to bring to learning and development interviews. 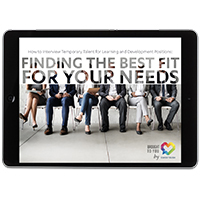 How to Interview Temporary Talent for Learning and Development Positions: Finding the Best Fit for Your Needs is available to download now. Arturo’s passion for people, culture, and team building means having your best interests at heart, a philosophy that shapes our Talent Solutions team and the way we work with both clients and job seekers. Contact Arturo at arturo@sweetrush.com. Rodrigo knows that it is the people and, by extension, the team, who really drive and enable business success. Through building teams, he helps unlock the secret formula organizations needs to thrive. Contact Rodrigo at rodrigo.salazar@sweetrush.com.